GENEVA - Marion Wheeler didn’t realize over 75 of her family members were waiting for her at the Geneva Community Center on Friday, Nov. 23, to wish her a happy birthday. The surprise came with a joyful greeting as Wheeler made her way into the building and tears filled her eyes as she scanned the room at the room full of smiling faces. Family members traveled from Colorado, California, North and South Carolina, Georgia and Florida to celebrate Wheeler’s milestone. Over 200 guests were invited, and many cousins, aunts and uncles, grandchildren and great-grandchildren filled the community center. Wheeler has over 27 grandchildren and many great-grandchildren, and all are adored. Kim Mitter, referred to by the entire family as “the planner,” was the one in charge of putting together the event, as well as the annual family reunions. “She’s extremely special to me, but we all wanted to put this on,” said Mitter. Growing up, Mitter enjoyed baking with Wheeler and reminisced on the countless school vacations she spent with her grandparents. “I got to spend a lot of time growing up with them, I was always visiting,” she said. There wasn’t a dry eye in the room as Wheeler sat next to her younger sister, Betty Zumpt, who has lived for 95 years. Wheeler used to work at a bakery, owned a grocery store and traveled all across the states to visit family and explore with her late husband. Currently, she lives by herself and does all of her gardening, house chores, reads two to three books a day and keeps in touch with all of her family members. “She’s very loved. She would do anything for anyone,” said Mitter. Kelly Melter, another granddaughter of Wheeler, expressed that no distance could keep her family apart. “Family is special. We don’t always see each other and when we do, it’s a truly special thing,” she said. 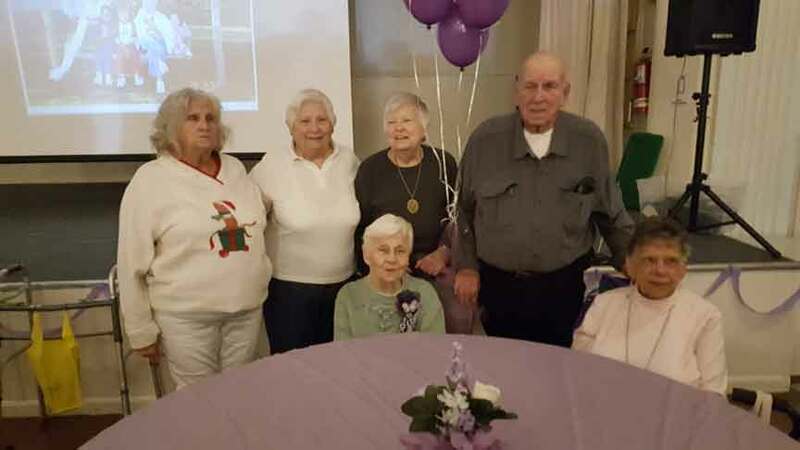 Friends and family continued to arrive to the party to wish Wheeler a happy birthday, and the family enjoyed food and cake while celebrating Wheeler’s new title as a centenarian. Marion Wheeler sits with her children and sister. Pictured, starting left, are her children Connie Spencer, Juanita Goddard, Barbara Reems and Cyrus Wheeler. In front are Marion Wheeler and her sister Betty Zumpt.